2. Provide an opportunity for graduate students to promote their talents and market themselves by visiting with industry and explaining their work experience. 3. Expose undergraduate and 1st-year MBA students to the variety of companies and employment opportunities they might encounter when searching for internship employment themselves. Bio: Solwoo Kim is a senior in Krannert School of Management, majoring in business management, with a concentration in marketing and international business. After finishing sophomore year, he volunteered to join R.O.K Military Service as coastal guard/body guard and finance associate the for police agency for a duration of two years. At Purdue, he is a brother in the business fraternity, Delta Sigma Pi and was VP of his pledge class and VP of marketing. Also he was the first VP of the internship abroad program at AIESEC Purdue, the global student leadership organization. Currently, he is a senior special events associate in Krannert and Krannert Executive Forum. After his marketing internship with headphone company, SOL REPUBLIC, he became a college representative working to increase brand recognition in the Mid-West. Solwoo Kim is really excited to participate in the poster competition and to share his great experience with SOL REPUBLIC last summer. Executive Summary Michael Phelps’ favorite headphone, SOL REPUBLIC, is global consumer electronic company designed to deliver the best sound system through headphone to the consumer’s ear. SOL REPUBLIC was founded by three founders, Kevin Lee, Scott Hix and Seth Combs. Kevin Lee was the executive member at Monster Cable, well known for making Beats by Dr. Dre headphones. SOL REPUBLIC is not only just provides the best quality headphones for a reasonable price, but also provides a music lifestyle to music lovers. SOL REPUBLIC works with a variety of individuals and groups including musicians, action sports players and record labels. SOL REPUBLIC shares the sound track of life with artists and acts as messenger between artists and music lovers. SOL REPUBLIC’s head-quarters are located in San Francisco, CA where I had an internship and multiple other cities including Willsonville, New York and San Clemente. My role for the summer internship was Community Marketing Assistant and Special Project Intern in the SOL REPUBLIC marketing team. The project included conducting research on existing platforms and communities and providing a plan to grow and engage the SOL REPUBLIC royal fan club as known as the SOLdier community for the coming year. My main role was engaging with fans and customers to answer their questions and motivate them to engage with our products through Facebook, Twitter, Youtube, Pinterest and Instagram. I also acted as communication bridge between San Francisco head-quarters and SOL REPUBLIC Korea distributors. I helped SOL REPUBLIC Korea distributors to understand the U.S. market’s marketing strategy and method. Later I got administrator status in Korea SOL REPUBLIC social media as well to update their social media and take care of Korean customers. Moreover SOL REPUBLIC just launched a new website for customers and fans, called SOLdier of Sound (www.soldierofsound.com). I was working with the web development team and community marketing team for better website. Currently the SOL REPUBLIC facebook page has about 90,000 likes and the SOLdier group includes 1,800 private fans. I increased social engagement by 2.3% and in July, more than 1000 people liked SOL REPUBLIC fan page in just one day. After I managed the SOL REPUBLIC Korea fan page, I increased 233% of facebook engagement. This was great increase brand recognition in Korea. In addition, I endorsed the famous musician, DJ Black Matter as SOL REPUBLIC saviors of sound. Right now, SOL REPUBLIC assigned me as the College Representative to help their marketing in Universities. Bio: I am a senior studying Management with a concentration in Operations Management and expect to graduate in May 2013. This past summer I completed an internship with John Deere in Supply Management. I also have accepted a full time job offer from John Deere and plan on completing their rotational program. My goal is to eventually become a manager and have a successful career at John Deere. Executive Summary This past summer I interned for John Deere in their Power Systems division in Waterloo, Iowa. I was in Supply Management for service parts and was responsible for multiple projects. The main project I was in charge of was developing a strategy to disposition inventory at a warehouse and implementing it. The warehouse had about 31,000 parts worth over $850,000. My strategy had multiple concepts. I was able to obsolete and scrap about 10% of the parts, eliminating the carrying and holding cost for those parts. I also helped resource these parts to an outside supplier who owned and managed the inventory. The advantage of this was John Deere would no longer incur the carrying costs of these parts. When John Deere required an order for one of these parts the company would sell it back to Deere at a higher price. The savings from eliminating the holding costs offset the higher price. This was a challenging project that I was able to complete before the end of the summer. I used many skills in this project such as; Data Analysis, Negotiation, and I learned how to use SAP. I also worked with a team to develop an obsolescence process for another division of the company. This project was difficult because the information we needed to obsolete a part was not in SAP. In order to find this information I had to work with engineering and find a spec level in SAP to determine when a part was last used in production. Once I learned how to do this I was able to create an obsolescence process. I trained a new part-time student on this process, so she could carry on the project after I left. I also created a training document for John Deere to use when training others to obsolete parts from this division. Bio: I am originally from Nigeria but I’ve spent the last 6 years at Purdue University obtaining my undergraduate degrees in Math and Chemical Engineering. Now I’m working on my MBA in International Business, Strategy and Marketing. Over the last 6 years, I have conducted 2 researches in nanotechnology and electro-kinetic remediation and 2 internships with P&G and GE. Upon graduation from Krannert, I will be joining GE as part of their Operations Management Leadership Program. But my life is not all work and no play. I’ve presided over the African Students association for 3 years and have delivered the best years the organization has seen. I am the ambassador for the Black Cultural Center and for the Krannert Masters Office of Admissions. I am a Bill Gates Millennium and a BOP scholar; I box for Indiana, play soccer for Team Africa and dance Argentinean Tango. I am also an author of 2 books: Lafayette Survival Guide and Verbal Vendettas: The Invasion of Privacy. In short, I like to live by my favorite quote: "Wherever you go, no matter the weather, always bring your own sunshine." Executive Summary GE Appliances was in a transitional phase of bringing back all the production capabilities and functions from China and Mexico back to Appliance Park in Louisville Kentucky. Stiff competition in a matured and sluggish appliances market forced GE Appliances to reevaluate and benchmark its sourcing strategies and processes against the Six Sigma and Toyota’s Kaizen methods. My summer role at GE Appliances was to maintain the sourcing status quo: driving all stages of the quoting process for the Dish team. Through strong networking, collaborations and corroborations, I was able to over deliver on the status quo and initiate both costs saving and continuous improvement initiatives. My role involved working with the design engineers to obtain the design specifications and parts needed for the dishwashers. It then shifted to working with a number of approved suppliers to ensure that they can deliver the required specifications on time and on budget. Once the designs specifications and suppliers are finalized, the costs of each sub-structure and the overall team is tracked weekly to ensure that all the teams are on target while continuously working with engineers, production teams and suppliers to ensure that all and any changes are accounted for. Outside of those functions, I took on several initiatives to revamp the tooling and cost trackers for the team, the invoice system for paying suppliers as well as initiated several cost analysis and model analysis projects that will save at least $1MM, over 10 hours/week and ensure that our suppliers are paid accurately and on time. Bio: I am a second year MBA student at Krannert, specializing in Operations and Strategy Management. I have a prior experience of five years in consulting and worked in summer as an Operations Intern at Cancer Treatment Centers of America. In my internship I conducted extensive regression analysis to develop my recommendation, which was approved and implemented by the executive team. I take pride in my analytical and problem solving skills. My long term goal is to be a part of the business development team working towards process improvement. Personally I enjoy listening to music, cooking and dancing. Having traveled around the globe has helped me develop sensitivity towards diverse cultures. Executive Summary This summer I had the opportunity to intern at Cancer Treatment Centers of America, headquartered in Schaumburg, Illinois. I was working as “Operations Interns” in the Empowerment division under the direct supervision of Director of Operations, Ms. Sally Dahl. Cancer Treatment Centers of America (CTCA) provides the most advanced and state of the art care to the most complex cancer types. Its unique business model incorporates helping patients fight against cancer using advanced technology and a personalized approach. Since CTCA is a private for profit health care facility, it has a unique business model for its patient acquisition process. CTCA possesses a group of specialized Oncology Information Specialists, who are the first medium of interaction between prospective patients or caregivers. This entire process is managed by optimal call scheduling, resource allocation and people management by the Operations division. The operations division leverages from six sigma practices to keep the abandon rates to as low as 2%. During my summer, I was involved in multiple projects aimed at achieving operational efficiency which could help get the chat/call abandon rate to rates lower than industry standards. I independently completed three main projects, all under the direct supervision of Ms. Sally Dahl. (1) Analyze the optimal number of production hours required by the Oncology Information Specialists to meet their monthly quotas. (2) Study the impact of the video chats over a period of 6 months and suggest recommendations to improvise it. I intend to use the poster competition organized by DCMME as a platform to spread the word about CTCA and share my insightful experiences. CTCA’s unique business model juxtaposes profit with care. Their mission, vision and values are all aligned with patient empowerment and they are committed to winning the fight against every type of cancer. Bio: Selected into the Krannert dual degree program 3+2 to earn the Bachelor of Science and Master’s of Business Administration degrees in five years; currently a second year MBA student with concentrations in Operations and Supply Chain. My short-term pursuit is to gain and refine Procurement related expertise with the long-term goal to explore roles not limited to Procurement within Supply Chain. The previous internship experiences sharpened my individual problem solving skills and granted me the ability to learn and apply knowledge within limited timing to accomplish the objectives. Executive Summary During the past summer, I had the opportunity to work for Schlumberger, a company which provides technology, information solutions and integrated project management that optimize reservoir performance for customers working in the oil and gas industry. The internship mainly focused on establishing various policies, procedures and standards related to the newly organized Global Procurement & Sourcing Function in order to help further facilitate the operational side of the business at superior levels of quality and efficiency. The project contained a variety of tasks concentrating on process and people, for example, procedure review for Sourcing, Supplier Management and Procurement, training materials update for Supplier On-Boarding Process, and process formalization for Supplier Business Review. In addition, SharePoint was utilized and designed specifically for the function to enable more transparency across business segments regarding different areas, GeoMarkets, product types and so on; real time knowledge sharing was achieved through the construction of the site. Bio: I am a senior major in Accounting and Management and have concentrations in Finance, Operations Management and Analytical Consulting. I will be graduating this coming December. I interned with Oerlikon Fairfield Manufacturing at Purchasing Department the past summer and am still working there throughout the semester. I did several cost saving analysis projects as well as some daily tasks such as processing purchase orders, negotiating prices with suppliers, generating purchase orders etc.. I gained a lot on-hand experience within the Operations Management field and am hoping to obtain a full-time position in the same area after I graduate. Executive Summary I started my 2012 summer internship with Oerlikon Fairfield Manufacturing around middle May, my internship lasted for 12 weeks, which sums up to my 60 days in Fairfield. Oerlikon Fairfield is the headquarter of Oerlikon’s drive system segment; it is located here in Lafayette near US 52. I worked at Purchasing MRO (Maintenance, Repairs, Operations) Department; my daily tasks included converting requisitions from different departments all over our plant, negotiating with suppliers in regards to products’ pricing and availability, generating weekly open order reports, and creating PO using AS400 system. Besides these, I also worked on several projects; one of my biggest projects is natural gas expense cost saving analysis since we started to buy contracts on natural gas towards the end of last year; I compared the actual monthly expense occurred from the invoices we received with the projection data and did a series of analysis on monthly saving, cost per unit savings and 5 year expense trends etc. ; I have also accomplished other projects on process improvement with our Accounting and Receiving Department, throughout the project, I was able to update system with new Purchase Orders on all of our Non-Tangible Assets (Service, Leases etc.) so that Accounting Payable would be able to pay all the Non-Tangible invoices without going through all the old process. Moreover, I worked on Logistic side as well and did analysis on our international freight shipments for the past one-year. Overall, Interning with Fairfield this summer provided me with lots of on-hand experience, which I could never learn in class; As a matter of fact, I am currently working part-time there through the semester as well, busy as I might be, I enjoy the process of learning to balance school and work, which would be a needed transaction for me to face the real-world after I graduate. Bio: Vijay Sachdeva is a MBA student at Krannert School of Management. Prior to joining the MBA program, Vijay was product managing 4G-LTE telecom products in a Japanese company in Tokyo. In the summer of 2012, he was in Washington-DC for his internship with a Switzerland-based telecom company. Vijay is currently involved with Operations club and Boiler-Volunteer-Networks at Purdue. In his free time, he enjoys cooking, reading literary travelogues, and studying cultures and languages. Vijay also speaks Japanese, which he learnt in Japan by going to weekly social gatherings. Executive Summary Introduction: In the summer of 2012, I did my internship with Ascom NetworkTesting Inc., in Reston, Virginia. Ascom is a major supplier of network testing products to operators in more than 180 countries. The internship was a great experience for me to get exposure to the strategic, operational and financial aspects of a USD 200 million business. During the 3 months I spent with Ascom, I could see the real-life application of the business concepts I had learnt in my MBA. It also taught me how to handle a big strategy-change by breaking it down into bits and pieces, defining the goal, and then aligning your actions in a way that brings you closer to your goal. I also learnt that a “top-down” strategy will work well for a forecast requirement, but to get to the real operational level, a company has to get down to the “bottom-up” level. I want to share the value-chain analysis shift of the telecom industry, the way incumbents are losing power to the Apples and Googles of the world, and also why this ecosystem shift is taking place. Also, I would describe how the major operators around the world are adopting the wait and watch strategy- operators are delaying their LTE investments. Those who are investing are deploying without enough testing. The business environment seem very challenging where businesses are scared that someone else would take away their share, so they are trying to protect their bottom line by cutting down the expenses. And this conservative attitude- in reality- might hurt incumbents more. Further, I would like to extend to the idea how businesses are adjusting their business models to fulfill the requirements of the current dynamics, which will include discussion of a few plausible scenarios businesses are experimenting these days. Bio: My name is Siying Gong, the second year student in MSHRM Program. I received my bachelor degree of Labor Relation in Renmin University of China. I have been exposed to different HR functions across industries as an HR consultant in Kingdee Corp. and China Consultants Corp. Engaged in Krannert, I am the president of Krannert Asian Business Club, the Planning Committee for 2nd Annual Executive Conference for Human Resource Professionals, and also in the Cross-Cultural Krannert Executive Committee. Executive Summary Arbitrage Magazine is first, student-run business magazine, targeted on universities students. Interned with Arbitrage Magazine, I have improved my virtual communication skills as well as deepened my insight into media & Journalism industry. As a recruiter in Arbitrage Magazine, I went through the full circle of recruitment when I was in Talent Pipeline project, and successfully hired ten talents for Art Department. Engaged in Arbitrage Magazine group, I have taken advantage of business exposure opportunities to develop the recruiting strategy especially for Art Department by identifying the KSAOs and designing the anchored rating scales. Furthermore, Arbitrage Magazine has its unique operating way. Most of the work is done virtually. This internship not only drives me to be a good HR business partner but also gives me a try on a virtual site, which will become the trend in the future. I believe that my special internship in the virtual organization and my business acumen as an HR person will be very attractive to company representatives. Bio: Graduated as a Computer Engineer at Simon Bolivar University in Venezuela. Currently a second-year MBA candidate with 3 years of experience in business mobile applications development, business applications consulting, and relational database administration. Focusing in operations management and passionate about using technology for process improvement initiatives. President of the Krannert Hispanic Management Association, mentor in the Mentorship Program for personal and professional development of first-year students and volunteer at the International Students Boiler Out program. Executive Summary My internship took place at Sears Holdings Corporation. I was specifically working in the Home Services business unit. This is one of the biggest business units, and is focused on appliances post-sale services. The two projects I worked on during my internship aim at appropriately adjusting the diagnostic fee of repair services and installation prices by regions across the nation. The approach to both projects was similar. For the past couple of years the department had been basing their pricing strategy on cost fluctuations and focusing on a certain percentage of margins, so they wanted to change this strategy to a value-based one. Additionally in the case of the diagnostic fee, Home Services had only one price for the whole nation, and they wanted to find out if having a different price for each region would be preferable. The objective is to increase profits from the repair and installation services by adjusting prices and still being competitive in each of the main markets. I first built a database of the competition prices, as the competition information the company had at that time was outdated. In order to collect this information, it was necessary to call and consult information on websites of the main competitors in 38 key cities across the nation to figure out their prices. The interesting part about the competitive analysis was that one could find more information than just prices. One could experience first hand the process a customer goes through to hire the service and the quality that the competition has, even details like how well their customer service central works. I documented all these findings to better judge the price adjustments that had to be made. Expected profits for the diagnostic fee project are around $600K yearly, and for the installation prices project $1.2M yearly. This proves that there were many hidden profits that could have been taken advantage of if the company had had an updated competitive analysis. Given the results of the internship the company plans build a dashboard with KPIs that could indicate the regularity with which the information has to be updated, like significant drops or increases in penetration rates of the services. Executive Summary For my poster, I would like to present my internship at Amazon. Over the summer, I had the opportunity to design and create an automated tracking system for their warehouse truck yards. The internship was 12 weeks, and in that time I was able to work with both associates on the ground level, and higher management. I did all of the time trials and development, and utilized the skills learned in my Krannert classes to develop simulation models prior to final planning. In my poster, I will go over what was required in my internship, what I accomplished, and the trips I was able to take over the course of the summer. Bio: My name is Sai Chennupati and I am a master’s student in Industrial Technology. I concentrate in supply chain risk management, operations, six sigma, lean manufacturing and finance. My short term goal is to secure a job that aligns my interests. 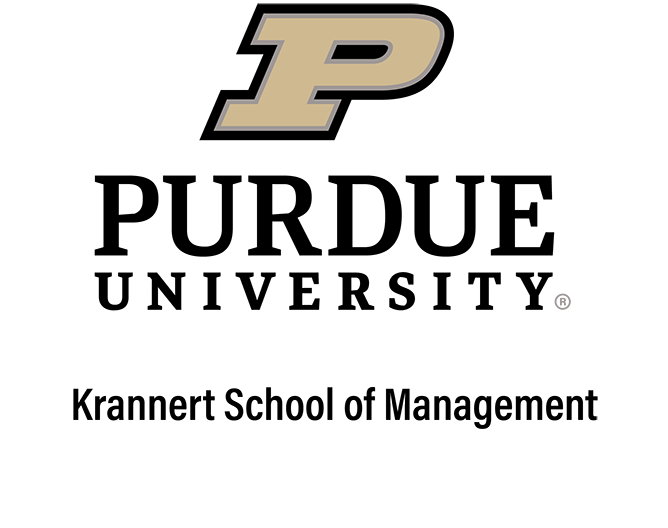 Besides academics, I represent my department as a senator and chair the Career Fair Committee in the Purdue Student Graduate Government (PGSG). I am also the president of Epsilon Pi Tau, an honorary society embracing technology. Executive Summary Supply chains are no longer supply chains. They have become intricate strands of web intertwined together making both the flow of information and flow of goods tougher and tougher every day. The severity of this situation is reflected in the purchasing department of any manufacturing company. Purchasing in an organization deals with the relationship between the buyers and suppliers to govern the flow of raw materials and semi-finished goods. There are various risks and uncertainties that exist in this department. There are also ways to mitigate these risks between the buyer and the supplier in a supply chain. Bio: Suki is a second-year HR graduate student in Krannert. Her undergraduate concentration was Information and Computing Science, which provided her a solid background in statistics and information systems. During her undergraduate study, she was a recruiting assistant at Alcated-Lucent, a global telecommunications equipment corporation. This experience demonstrated that she has the ability to communicate with people from different disciplines as an HR. In addition, her experience of working at a headhunter company sharpened her talent acquisition skills and business acumen. In the summer of 2012, she worked as a talent management intern in Cummins Inc. Her cross-cultural experience, multilingual and excellent interpersonal skills granted her ability to work in Human Resources. Executive Summary During 2012 summer, I worked at Cummins as a talent management intern. I have various projects and my poster will focus on two major ones. First, I designed and implemented the pre-arrival activities for technical functional excellence by saving 80% of processing time. The project aimed at helping the new hired to have their necessary tools ready before they get onboard. I conducted the voice of customer with the employees and the voice of business with technical leaders to find out the gaps. Then I found out what the bottleneck was and proposed a new procedure to apply for the tools and streamline the process. At the last month of my internship, I selected the team for piloting my project and found the new process shorten the lead time significantly. Second, I designed training metrics and supported technical engineer function by managing and administering training program. The metrics I designed gained positive feedback from the executive technical leader and it is used by the business until after I finished my internship. As an intern in Cummins, the biggest takeaway is that it is not easy or even feasible to find out an optimized plan from analysis or calculation when taking initiative. The best method is to prototype and then to refine the process during implementation, and therefore we can achieve the functional operational excellence.